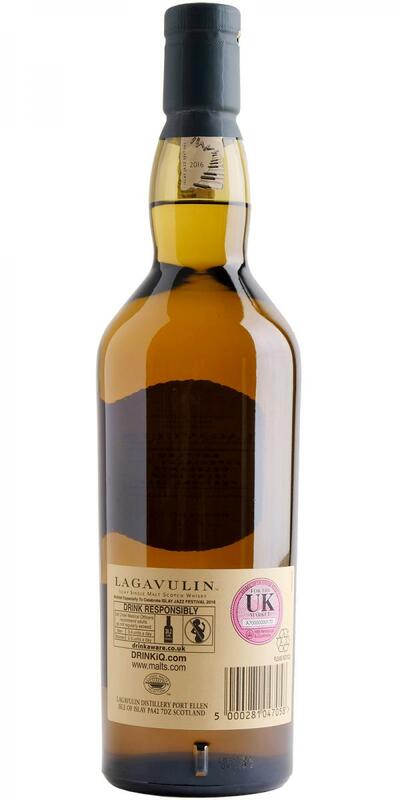 A wonderfully balanced and complex Lagavulin. 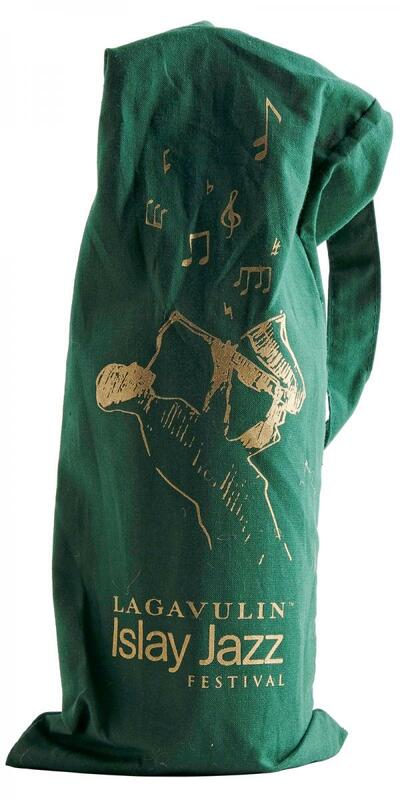 Powerful and yet soft, the aromas are all well integrated. The secret star of Fèis Ìle 2017. 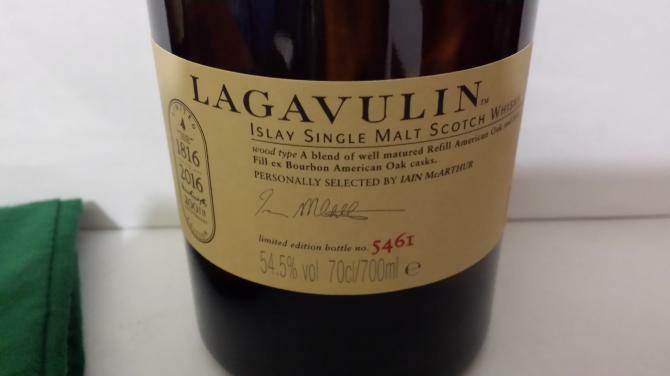 Extremely dense nose, very sherry, and without sherry, where is the Lagavulin? After a few minutes he is there, along with lots of Led er, bright yellow fruit, citrus flavors and a good dash of vanilla over some hickory smoked barbecue. At some distance a fire blazes. Much later, the smoke has almost disappeared and only a hint of lemon comes to a full portion of caramel pudding. Only exercise brings back light smoke, peaches and mirabelles. Warms smoke from a stifling log fire, floor wax, iodine, the warmer it gets, the more the fire blazes again, it goes more and more towards chemical fire. The yellow fruits are also always juicier and more mature, a lot of peaches. From time to time also a floral approach, almost perfumed. Rich, full, well-integrated alcohol, in the taste initially very light with light honey, darker and maltier behind, dark caramel, slightly burnt and a little salted. Add to that very slowly white pepper to back a very gentle bitterness. In the finish, the sweet tones are gone first, only much later go the tannins, until the end even sweet ash on the tongue remains, and for a very long time. huge batch of 6000 bottles so still available at the distillery at 99.00 today. might have some left for the feis for anyone that's going. Please don't buy on the secondary market!! 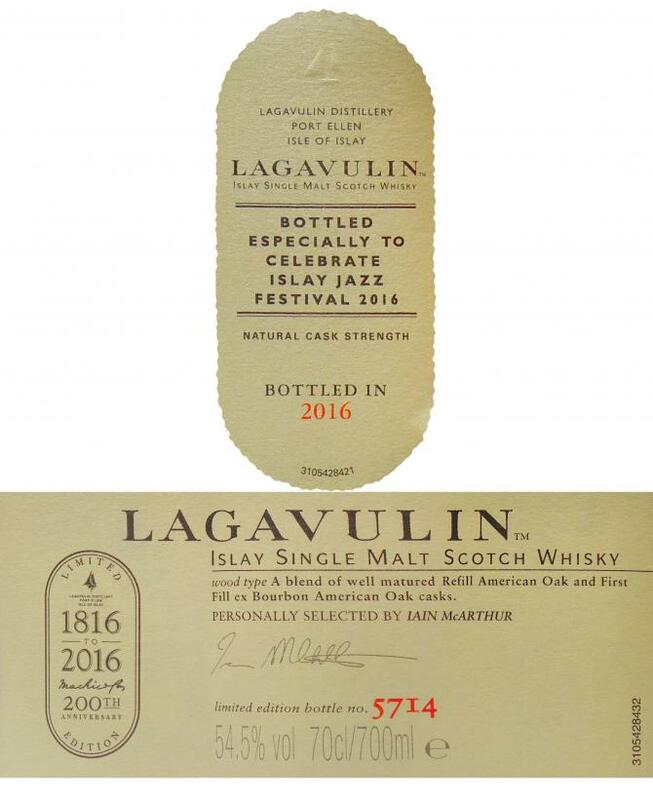 [May, 2017] According to Georgie this edition is composed of roughly 75 per cent of 15 year old from selected refill casks (designated to the 16 year standard edition) and 25 per cent of 7 year old from first fill bourbon casks. 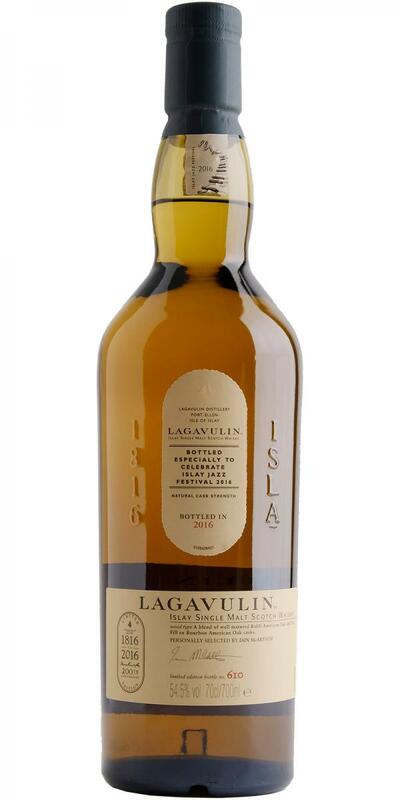 A beautiful trio is formed immediately between peat, citrus and malt. With the opening come the zest of grapefruit, salt, vanilla, chocolate and coffee. Espresso ! Beautifully bitter. Dark chocolate. Length! Vegetable notes evoking the best mezcals. On the nose, a profile similar to Lagavulin 12 years. Greasy, smoky, marine, a little sweetness brought by citrus and an earthy dimension after a few sips. On the palate it slice net, with the same ranges both fat and coastal. Final rather short, with a touch of leather. Effective, but too minimalist for my tastes. Blind tasting : Pure an average, young smoker with his climax the second after the first sip. With water much more interesting and complex, because the smoke is not so blatant over everything. And I must say that I like smoky whiskys. But before the game with water, he simply gave me less than most other smoky whiskys. And the resolution has made me then at a loss ... Since I prefer the 16er before (even with the same price). 78 points without water, 83 with! Smoke. Intense, young and cold smoke. After a few moments sweetness comes through. However, it remains that intense smoke dominates. Water : Fortunately, I added a few drops of water, otherwise the evening would have been gone. How interesting! Two drops of water attract such intense sweet vanilla from the glass, which is actually able to displace the smoke! The nose is more than pleasant, really tasty. Luckily more than feared! Even before the smoke hits the sweet and she really does - it strikes. Intense and powerful, she knocks on the tongue. Hardly 1-2 seconds later, you realize why she is in such a hurry - she is persecuted by the smoke. The smoke catches up with them, sweeps them away and leaves ashes. So a young smoke monster! Then the second sip, one prepares for similar, but what happens? Seasoning is here, delicious herbs, sweet herbs? No time to worry ..... WASH ... ashes. The smoke has won again. Water : Even in the taste of the whisky is much milder, but after swallowing, I expose myself as a naïve dreamer. There it is again, the ashes. Luckily, the nose stays so pleasant, at least the smoke does not make it any longer. The ash remains in the mouth for a long time, but other impressions can only last for a few seconds. Direct is the typical Laga fragrance in the nose. Great smoke paired with a delicious sweetness. Classical noble Ayla, deep, complex, everything in its place, neither add nor subtract. Open, dry, smoky planks, cooled fire, raw ash, smoked products, fresh board, a little greens, field grasses, wet wool. Dense, oily, smoke, peat, lemon peel, peppery, smoked, crust of black bread, sweet confectionery notes, caramel, cocoa, cappuccino, toffee, fried nuts. Soft, velvety, continued taste, cappuccino, nuts, orange peel, smoke and peat in the background.